Bicheno is home to many commercial rock lobster fishers and quite a few recreational fishers also try their hand as well. Rock lobster can be taken in pots, rings or by gloved hand by divers. All methods must be licensed. Another expensive shellfish, abalone are also eagerly sought. It is a delicacy that can be taken by divers. A licence is required. Due to Bicheno's open exposure to the Tasman Sea many recreational anglers are either rock or beach fishers. A vessel capable of coping with large, unpredictable seas is needed here. Some beach fishing occurs north of Bicheno and also south towards Coles Bay at Friendly Beaches. Australian salmon, flathead and shark are targeted in the surf, while striped trumpeter, barracouta, morwong, leatherjacket and cod are taken offshore. Rocky shores abound around Bicheno and many areas are suitable as fishing platforms. A silver sliced lure is the most common hardware and bait fishing techniques here are less common. There is a marine reserve around Governors Island, opposite The Gulch, which provides an excellent opportunity for diving. The wharf at the Gulch is a popular place to visit in the evenings for salmon, mackerel and trevally to name just a few. It is also a great spot for kids. North of Bicheno are a few accessible beaches that are worth a try if you can find some gutters. In particular the beach from the turn-off at Four Mile Beach all the way around to the bluff at the southern end of the beach can be good, but look for gutters for the best results. Getting there; 3 hours from Hobart, 2 hours + from Launceston. Major angling species; Rock lobster, flathead, couta and striped trumpeter, albacore, southern bluefin tuna, marlin, Australian Salmon, bream. Other attractions; Swimming, surfing, sight seeing, diving. Scamander River is one of Tasmania's great bream locations. Fish are not as big as in some of the other estuaries, but they are plentiful. It fishes well all year, but the best time is from November to March. Usual methods such as bait fishing and lure fishing are the way to go. Pretty fish and shrimps are some of the best baits, but it pays to have a variety. Locals comment that the fishing now is as good or better than fifty years ago. Bait is available from the shops in Scamander. You can also expect to catch a few nice salmon, silver trevally and mullet. There are also luderick around the bridge pylons at the mouth of the river. Very few people fish for these, but they are there in good numbers for the angler with the skill and perserverance. You can drive for quite a way up the river by heading to Upper Scamander. The meandering upper reaches are home to bream as well as trout. Fishing is quite easy along the easily accessed banks, but a boat can open up a few more opportunities. There is also a Professional guide operating bream and inshore tours from St Helens. The beaches around Scamander provide some first class fishing. Big Australian salmon, large flathead and sharks are the main targets. Possibly the best beach around this area is Beaumaris Beach. The northern end is the most productive, and often only a short cast is needed to put your bait into the deep water where salmon up to three kilos are caught. Pulfers reef, directly off Scamander is highly renowned as a good striped trumpeter location as well as big flathead and morwong. In the summer months, yellowfin tuna, albacore and striped marlin come close to shore. There is no good quality, sea access, boat ramp around Scamander so it is best to drive up to St Helens and launch from there. Getting there; 2 1/2 hours from Hobart, 2 hours+ from Launceston. Major angling species; Rock lobster, flathead, couta and striped trumpeter, albacore, southern bluefin tuna, Australian Salmon, bream. Other attractions; Swimming, surfing, sight seeing, National Parks - Douglas, Apsley and Freycinet, wineries. 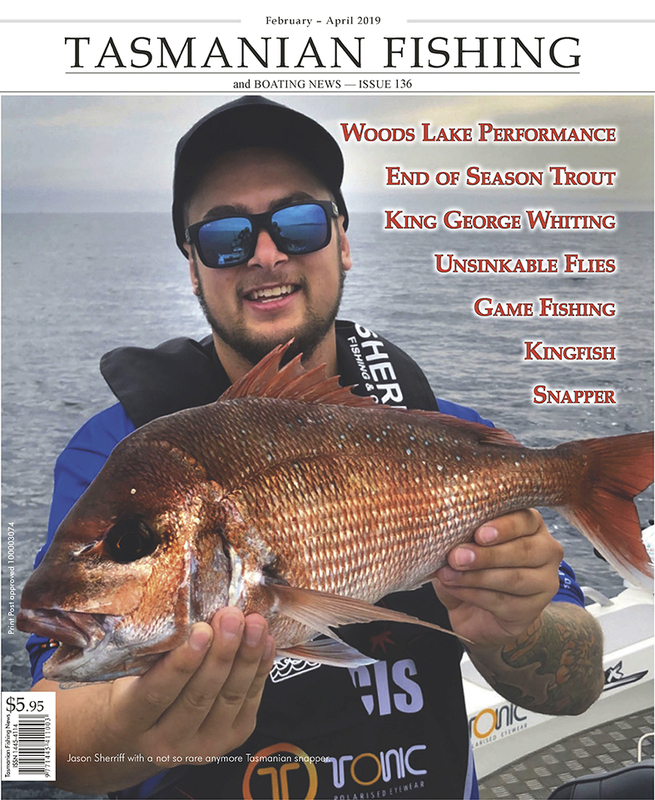 The mid-east coast of Tasmania boasts some tremendous fishing with St Helens, at the northern end of the east coast and Tasman Peninsula at the southern end rated as Tasmania's premium game fishing areas. The 15 kilometre run from Coles Bay at the northern end of Freycinet Peninsula out to open water - through Schouten Passage is probably the reason more game fishing is not undertaken here. Most game fishing is undertaken by holiday home owners in the area. Coles Bay is a superb protected bay with many holiday homes. Flathead are the prime target in Great Oyster Bay as are seasonal squid. Large wrasse are also easily caught, but rarely kept as food. Whiting are targeted by a few anglers, but these seem to be in isolated pockets. Shore and boat fishing is popular in the Swan River, just north of Swansea - especially for bream. One kilogram specimens are common and 2 kg fish regularly taken. There are several easily reached access points on the Swan River - mostly along the Dolphin Sands road. Crabs, prawns, pretty fish and nippers all make good bait. The Swan River also has good fishing in the lower reaches for large garfish and leatherjacket. While a boat can be useful here it is not essential for success. On the southern side of Dolphin Sands is Great Oyster Bay. Nine Mile Beach and the many other beaches and rocky outcrops that flank the northern and western sides of Great Oyster Bay are great and popular fisheries. While boat owners can access more water, the flat, mostly featureless sandy bottom of Great Oyster Bay yields little more than those outlined earlier. Most boat anglers drift for flathead with baits. Recently some anglers also successfully use large, bibbed lures in the more shallow areas with great results. 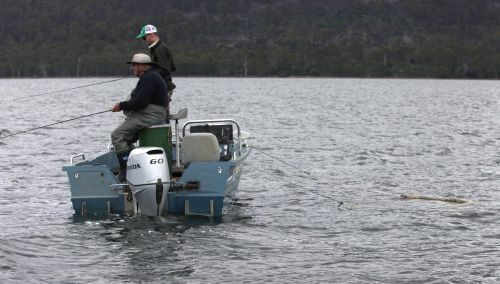 Anglers without a boat need not despair as fishing from many access points beside the main highway, on the western side of Great Oyster Bay, is often just as productive as from a boat in the more open waters. The main pier at both Swansea and Coles Bay often has good congregations of squid that can be caught by anglers with jigs especially at evening. Schools of small Australian salmon and long fin pike are also common off these jetties as are mackerel. A day on Great Oyster Bay can reward anglers with schools of dolphins, seals and whales as well as sea eagles and other extraordinary sights of nature. A run down Great Oyster Bay takes you to Schouten Passage a deep water channel between Freycinet Peninsula and Schouten Island - a channel that is rich in food, fish and often turbulent currents. Down deep there are big flathead and wrasse with an infrequent striped trumpeter. It is often difficult to fish the bottom through the channel and large sinkers are needed. Out through "the passage"striped trumpeter and large flathead are more common, yet certainly not prolific. A daily catch of four or five trumpeter is considered good. Tuna can be caught close to shore. Albacore are more common here, while southern bluefin and sometime yellowfin are caught. Mako and blue shark are also taken. The southern tip and eastern shores of Schouten Island are the most productive. A charter boat operates from Coles Bay and as well as fishing, offers sight-seeing and dive charters. This is one of the most scenic and beautiful parts of Tasmania. It would be a rare day when you couldn't catch a fish or be held spellbound by the beauty of the area. It's early February, and with the water temperature starting to rise, and the appearance of the small pelagic tuna off the north east coast. Wade Pelham and myself decided it would be a good time to seek out a highly regarded game fish; the Blue Pointer or more commonly known as the Mako.